The Holy Virgin Martyr Cecilia and the Holy Martyrs Valerian, Tiburtius and Maximus: Saint Cecilia was born in Rome of wealthy and illustrious parents. From her youth she was raised in the Christian Faith. She prayed fervently, she helped those in need, and beneath her fine clothing she wore a hairshirt. Though she had vowed to preserve her virginity for Christ, her parents decided to give her in marriage to the noble pagan Valerian. The saint did not dare oppose the will of her parents, but with tears she prayed to God that her betrothed would believe in Christ, and that He would send an angel to preserve her virginity. On the night of their marriage, Cecilia told her husband that an angel stood by to guard her. She warned him that he would be slain if he dared to touch her. Valerian asked to see this angel, but his bride told him that he could not see the angel until he had been cleansed of the impurity of unbelief. “How may I be cleansed?” he asked. She said that if he asked Bishop Urban for Baptism, he would be able to see the angel. The saint persuaded her fiancé to go with her to Bishop Urban, who was hiding from the persecution in a cave along the Appian Way. The instructions of the wise bishop permeated the soul of Valerian, and both he and his brother Tiburtius believed in Christ and were converted to Christianity. The brothers distributed part of their inheritance to the poor, cared for the sick, and buried Christians tortured to death by the persecutors. The governor Almachius, having learned of this, gave orders to arrest the brothers and bring them to trial. He demanded that the saints renounce Christ and offer sacrifice to the pagan gods, and the brothers refused. Then they mercilessly began to scourge the brothers. Saint Valerian under torture urged Christians not to be afraid of torments, but to stand firm for Christ. The governor, wanting to prevent the holy preacher from influencing the people, ordered that the martyrs be taken outside the city limits and executed there. The detachment of soldiers accompanying the martyrs to execution was commanded by Maximus. He was amazed at the courage of the saints, and asked them why they did not fear death. The holy brothers answered that they were relinquishing this temporal life for life eternal. Maximus wanted to learn the teaching of Christians in detail. He took Saints Valerian and Tiburtius to his own house and conversed with them all night. When she heard of this, Saint Cecilia went with a priest to Maximus, and he with all his family accepted holy Baptism. On the following day when they beheaded the Martyrs Valerian and Tiburtius, Saint Maximus confessed before everyone that he saw how their holy souls had gone up to Heaven. For this confession the holy Martyr Maximus was scourged to death with whips. 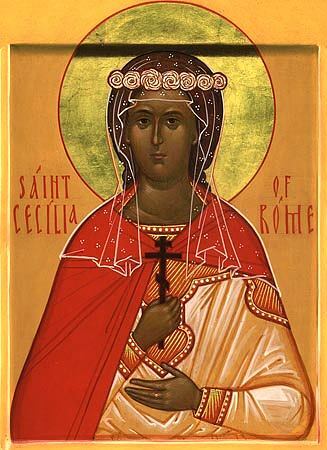 The governor wanted to confiscate the property of the executed, but when he was told that Saint Cecilia had already distributed all her remaining wealth to the poor and by her preaching had converted 400 men, he ordered her execution. For three days they tormented her with fire and smoke in a red-hot bath-house, but the grace of God helped her. Then they decided to behead her. The executioner struck the saint three times with a sword, but only wounded her. The holy Martyr lived three more days in full consciousness, encouraging those around her, and died with prayer on her lips.